With so many ways for Bay Area residents to spend a romantic weekend, it's hard to choose! This Thanksgiving, we returned to Half Moon Bay, California. The Bay Area is such a pleasure when the roads are empty! Leaving home a bit after 11 a.m. on Thursday morning, Waze routed us over the Bay Bridge, through San Francisco, and treated us to a relaxing drive down the coast. We pulled up to the entrance to the Ritz Carlton Half Moon Bay by noon. Hanging out in the Club... Our room was ready, and after unpacking, we went straight to the Club for lunch. If you've never booked a Club room at a Ritz-Carlton, you're missing a treat. With five meal presentations during the day, the lunch spread included pumpkin soup, sandwiches, salads, cheeses, and desserts ... not to mention Ritz Carlton's addictive chocolate chip cookies. The breakfast buffet now includes an omelet station where the chef will cook your eggs to order ... and Club guests enjoy complimentary cocktails in the late afternoon ... and dessert temptations in the evening. Golf anyone? 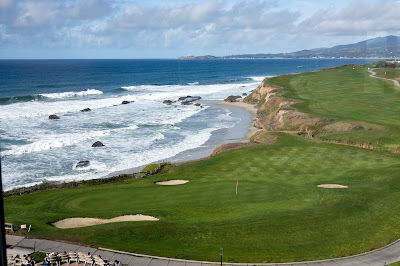 The Club's windows look out over the 9th green of the Ocean Course of the Half Moon Bay Golf Links, and I had fun watching golfers playing the hole. But you don't have to just watch... golfers will enjoy the challenge of playing two championship courses — the Old Course and the Ocean Course. Half Moon Bay is a town with cute shops and good restaurants. We reserved a table for two for Thanksgiving Dinner at Pasta Moon, and our meal was excellent. There were six main course menu options, but I chose the Diestel Farms Turkey — moist and flavorful! I loved my dessert of Warm Molten Chocolate Cake with a scoop of vanilla chocolate gelato. Reservations were definitely necessary, so I'm glad I consulted Open Table. There's plenty to do to fill a weekend. You can stay at the Ritz-Carlton and luxuriate in the spa — or you can venture forth to hike the redwoods or explore miles of beaches. Here's my blog from my last visit two years ago. 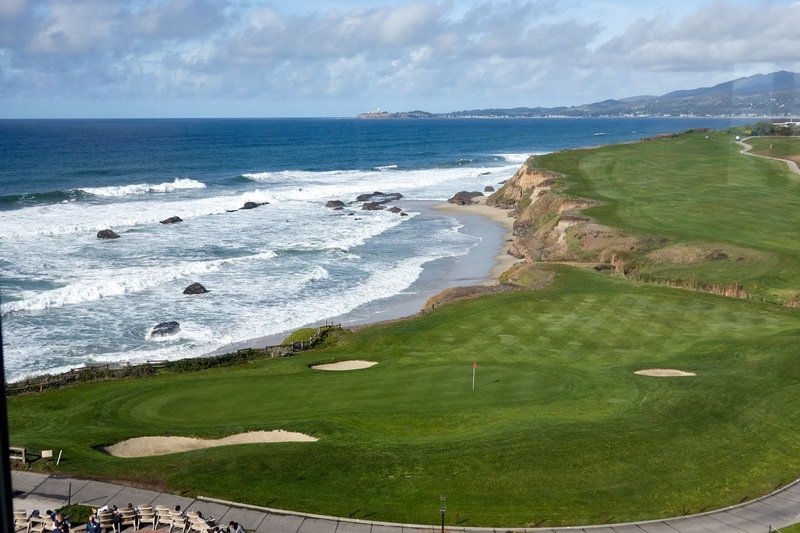 The smart way to stay at RC Half Moon Bay — book through your Virtuoso travel consultant and enjoy a complimentary Full Breakfast for two daily as well as a $100 credit towards a heavenly spa treatment.